The projected net benefits (short, intermediate, and long term) of facilitating research to improve diagnosis are enormous. In the short term, the field is currently so underfunded that the marginal utility/value of each additional research dollar is likely to be substantial. In the intermediate term, there are promising solutions in the research pipeline for specific ‘Big Three’ problems that would eliminate low-value diagnostic care (low quality, high cost). For example, rectifying the known problem of stroke misdiagnosis in patients with dizziness/vertigo clinical presentations could eliminate 45,000-75,000 missed strokes, avert 15,000-25,000 serious patient harms, and save the healthcare system an estimated $1 billion per year (currently wasted on unnecessary imaging and hospital admissions for patients with benign ear conditions that mimic strokes). Technology-based solutions are now being developed and tested, but need additional research to be ready for widespread dissemination. In the long term, research which leads to improved diagnosis will not only be cost effective, but will almost always produce higher quality care and cost savings in situations where misdiagnoses are currently frequent. When we improve diagnosis, we realign resource use, increasing value. Improving diagnosis saves both lives and money. Typical high-stakes diagnostic decisions are about differentiating dangerous diseases (in need of intensive diagnostic investigations or treatments) from benign diseases (not in need of intensive diagnostic investigations or treatments). The per-patient costs of care for dangerous diseases are generally greater than those for benign diseases, but there are many more patients with benign diseases. 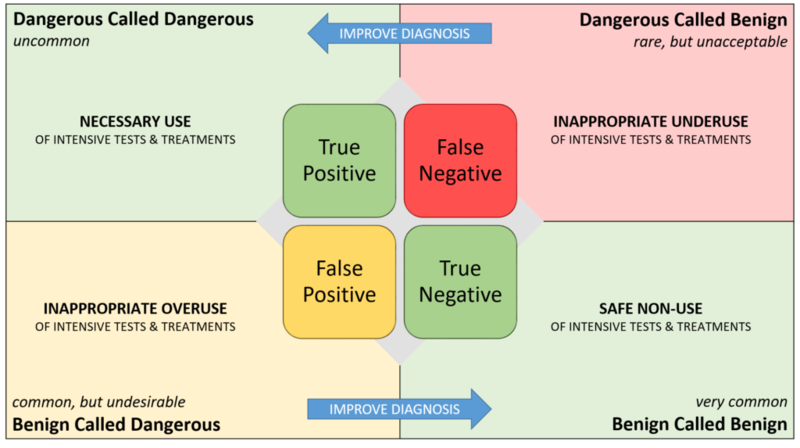 When we improve diagnosis beyond current practice (rather than merely trading off risks), we decrease both false negative and false positive classifications. Reducing false negatives for dangerous diseases saves lives (sometimes at added cost), while reducing false positives for benign diseases saves money (without harming patients). This combination results in high-value diagnosis that is both high quality and low cost.